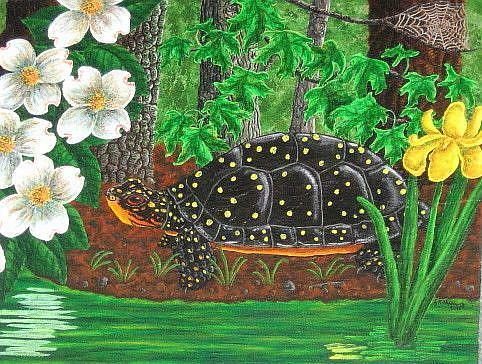 This was a commission for a private collection of an endangered Spotted Turtle in springtime. I wanted to make the season very obvious, so had several spring floral species such as dogwoods on the left and a yellow flag iris in the water at right. The painting was very intricate and took a long time to do. But the customer said "it exceeded his expectations" which was a joy to hear. I was pleased at how it all turned out.